In December, as the United States entered the 10th year of what President Obama called the "good war" in Afghanistan, I traveled to Kabul to take stock of the human toll of the increasingly bloody occupation. From the moment I landed in Kabul's airport, I noticed its distinctive smell -- a unique mix of dust, smog, and burning wood. The poor air quality, I learned, is a direct result of the wars. In an attempt to quantify the damage done by air pollution, Afghan authorities recently announced that 3,000 people die every year in Kabul due to the poor air quality, making it a more effective killer of Afghans than the Taliban. War not only destroys people, but it poisons the earth itself, which leads to more deaths. The ongoing U.S. military offensive in the south and east of Afghanistan has also led to a surge in the number of internally displaced people. According to U.N. High Commissioner for Refugees, there are now at least 319,000 internally displaced persons in Afghanistan, 120,000 of whom fled their homes between June 2009 and September 2010. I visited Charahi Qambar, the largest of these camps for the internally displaced, on the outskirts of Kabul, and was horrified by the conditions in which the people there are forced to live. They occupy simple mud huts with only tarps for roofs. Apart from blankets and burning wood or trash in the evenings, there is nothing to keep their hovels free of the bitter cold of winter, which regularly kills the most vulnerable throughout the camp. There is inadequate access to food, clean water, education, or work. "Do you think this is a human way to live?" one Afghan man asked us in utter desperation. His anger was palpable. Other effects of the war are perhaps less obvious, but no less painful or destructive. Both soldiers and civilians who are fortunate enough to survive war with their lives and limbs intact often cannot avoid the psychological scars of violence. More than 2 million Americans have been deployed to Iraq and Afghanistan; it has been estimated that some 400,000 veterans of these wars suffer from post-traumatic stress disorder, and suicide rates in the U.S. military have at least doubled over the last decade. After enduring decades of war and extreme poverty without respite, the situation is much worse for Afghan civilians. Last October, Dr. Suraya Dalil, Afghanistan's acting Public Health Minister, warned that more than 60 percent of the country's 28 million citizens are currently suffering from stress disorders or other mental health problems. Eric Stoner is a writer based in New York, and an adjunct professor at St. Peter's College. His articles have appeared in The Guardian, Mother Jones, The Nation, In These Times, and the Pittsburgh Post-Gazette. He is on the national board of the War Resisters League, and the advisory board of the Center for Peacemaking at Marquette University. He travelled to Afghanistan in December with Voices for Creative Nonviolence. 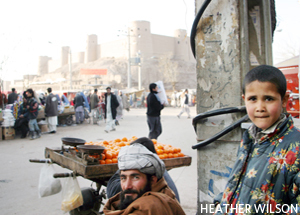 +Click here to visit Sojourners' Afghanistan campaign page and join us in the effort to bring the war and occupation in Afghanistan to an end.